Over time your gourd racks ropes can fray. You should visually inspect your ropes before your martins return. If you see signs of wear it is time to replace the rope (note: small tufts on the rope is normal). We offer replacement ropes for the 8-Unit, DGR12, and AAA Gourd Rack. Two sizes available. Use 45-foot if your pole stands 14' tall. Use 55-foot if you have added the extension piece and or your pole stands 16-foot tall. 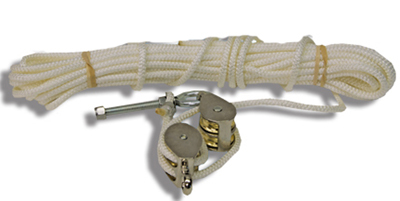 Our Replacement Ropes include a new eyebolt with pulleys. Please oil your pulleys using 3in1 oil. As you will need to remove the pole from the ground stake the rope replacement should be done before at after your martins leave.